As spring approaches the southern hemisphere, horse owners are being warned to keep an eye out for snakes, which end their winter hibernation as warmer weather and drier conditions arrive. Snakes tend to be their most active at the end of the day, and Australian Veterinary Association (AVA) President Dr Robert Johnson says that while most snake bites tend to occur in the late afternoon or early evening, it’s important for people to remain vigilant throughout the day for the slithery predators. “Snakes in sheds are probably looking for mice or rats, so keeping your shed clean can help to avoid this problem. They tend to be attracted to areas where there’s a good supply of rats and mice, wood piles and piles of rubbish,” Johnson said. “Outside, keep a close eye for snakes in bushy areas or near water. It’s best to try to keep horses, cattle and sheep away from bushy areas if possible. “Dog owners should avoid snake-prone areas, particularly if they are walking their dog at the end of the day. Snakes can also venture into backyards, and over the spring and summer months even city dogs and cats can be at risk,” he said. In the US, researchers have found that snakes play a role in the transmission cycle of Eastern Equine Encephalomyelitis Virus (EEEV), one of the most lethal mosquito-borne viruses affecting horses and humans. The deadly virus is endemic to the United States, and has been detected in Central, South and North America. Dr Johnson said it’s important for animal owners to be aware of the signs of a snake bite as owners may not actually see their animal being bitten. According to a US study, no first-aid treatments performed by owners in the field have proven especially helpful, and many home-based remedies can even be harmful, says Dr Cynthia Gaskill, the head veterinary clinical toxicologist in the Veterinary Diagnostic Laboratory at the University of Kentucky. Keeping a horse calm and arranging for immediate veterinary care is the best strategy when snake bites occur. Clinical signs of snakebite in horses vary widely, but generally include pain and swelling at the bite site, and often sloughing of tissue near the bite. Bite wounds may not be readily apparent. Dry bites with little venom injected or bites from copperhead snakes often cause only mild signs. 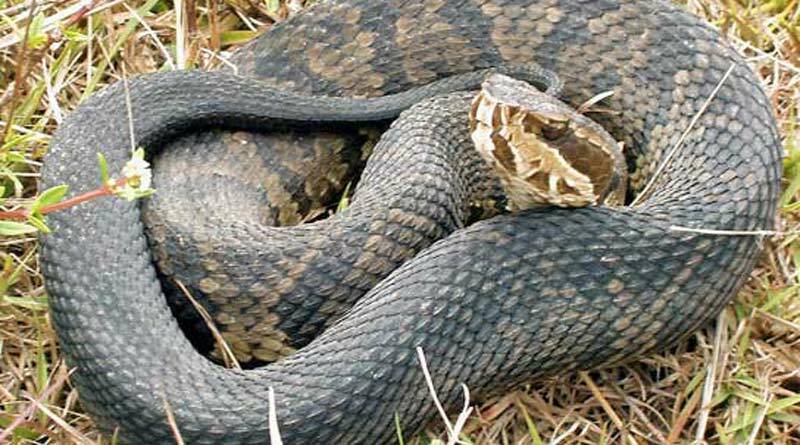 Bites from dangerous species of snakes and large doses of venom can cause marked pain and swelling, coagulopathy, hemorrhage, cardiac arrhythmias, shock, collapse, and even death. With neurotoxic venoms, paralysis can occur. Horses bitten on the nose can develop nasal swelling and respiratory distress. Signs from snake bites can occur within minutes or be delayed for many hours. Johnson says the chances of recovery are much greater if treatment is delivered early. “If you think your animal has been bitten contact your vet immediately. If you can’t get veterinary attention immediately, applying a pressure bandage over and around the bite site can help slow the venom spreading to the heart, and try to keep your pet as calm as possible,” he said.